This free e-book from the International Medical Veritas Association (IMVA) is now available to anyone who wants to read about the dangers of vaccines and pediatric medical practices. This e-book is titled "The Terror of Pediatric Medicine" and as Mark Sircus Ac, OMD said "by the time you finish reading this book, you will understand the title." This is an updated version of his remarkable and widely distributed mini-book: "Cry of the Heart" and how today's practices in pediatric medicine are putting our children in harm's way to an extent deplorable in today's changing world. Its crucial to stay fully informed as the vaccine schedules increase the numbers of recommended vaccines, and as attempts are made to literally force them on all children. 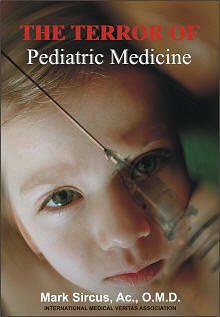 This is an updated version of his early work in the vaccine field, a widely published mini book: "Cry of the Heart." The new book covers in-depth the vaccine controversy, pediatric dentistry, oncology as well as childhood psychiatry and psychology. The book format is in beautiful html and offers us hope and solutions for a world of medicine gone mad and is especially timely considering the recent information on the state legislators, backed heavily by the pharmaceutical companies and political groups, who are attempting and suceeding in making mandatory the new and unproven HPV vaccine against cervical cancer for all girls at age 11.